Genitiana Combination clears liver heat and dampness. It also modulates urogential tract immunity. This is the classical Gentiana Combination formulation used for centuries in Asia. What distinguishes DragonHerbs Gentiana Combination fromother brands is the quality of theherbs used to produce it, and the productiontechnology. All herbs in china (and from most places) come indifferent grades based upon their variety, seed stock, growing source, growingconditions, care of the cultivators or collectors, and processing at variousstages of the supply chain and during production. That's a lot to consider, but Dragon Herbsdoes take all these into account in selecting the raw materials and inproduction of their herbal products. Gentiana Combination isso widely consumed in China that many domestic herb factories produce it. Mostof this production uses low grade herbs for price reasons. Dragon Herbs does not use low grade, lesseffective, raw materials for Gentiana Combination orany of its products. Dragon herbs identifies sources of the best raw material,the kind preferred in Shanghai or Hong Kong by those who know herbs and wantthe best. We use this premium material to produce this important formula. Production technology also matters. Most factoriesjust throw the herbs into a tank and cook the whole thing for a couple ofhours, then they make a powdered extract of the teausing a lot of excipient (usually not natural). 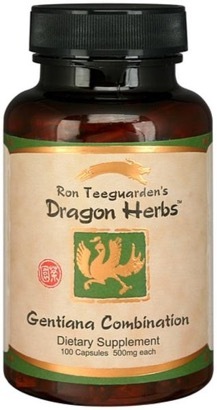 Dragon Herbs uses lowtemperature extraction using very pure water and no chemicals. The herbsare carefully added at incremental stages. Some of the herbs in Gentiana Combination can only be cooked for afew minutes. These "short cook" herbs are cooked separately andcarefully and added at the end. One very important process that most factories skipinvolves the collection of aromatic oilsfrom the tea. Real Gentiana Combination hasa bitter-spicy aroma. This is from the aromatic oils in the herbs. If the herbsare overcooked and the oils allowed to evaporate, thetrue power of Gentiana Combination cannotbe achieved – even if good quality herbs are used. Dragon Herbs always processes it herbs using an"oil trap." An oil trap is a sophisticated device connected to theextraction system. It captures evaporating aromatic oils and collects them incrystallized form. These collected aromatic oils are therefore not lost. Theyare added back into the extract at the end of the process. And this makes ALLThe difference! When you smell DragonHerbs Gentiana Combination, and other DragonHerbs powdered extracts, you can always smell the aromatic oils. These oils arenot present in most other brands of powdered extract. It is something Dragon Herbs paysextra for, but you the customer doesn't. We know that for an herbal extractto work, it must be made correctly and with the best technology available inthe world. Gentiana scabra root, Asian water plantain rhizome, Bupleurum root, Akebia stem, Asian plantain seed, Dang Gui root, Raw Rehmannia root, Gardenia fruit, Chinese Scutellaria root, Chinese Licorice root. Vegetarian capsules (Pullulan caps 100% natural, water-soluble polysaccharide produced through a fermentation process; vegetable origin; non-GMO; no starch, preservatives or chemical modifications; gluten free), rice powder.